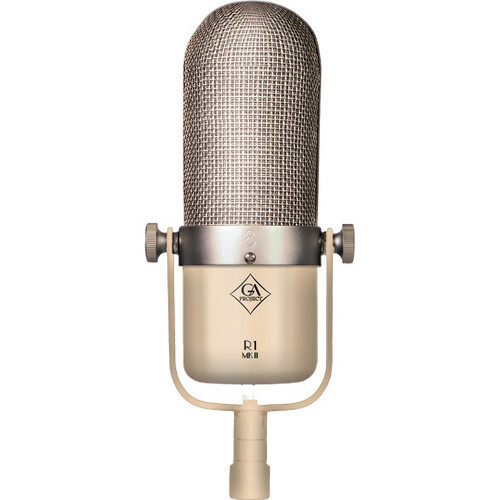 The R1 MKII from Golden Age Project is a ribbon microphone that offers characteristic ribbon performance. It gives you the smooth high end and extended lows that make ribbon mics so popular with recording engineers and producers. Outfitted with a ribbon that's 50mm long and 2 microns thick, the R1 MKII provides fast and life-like transient response, and can handle extremely high sound pressure levels—up to 160 dB SPL. As is typical for a ribbon mic, it has a figure-8 polar pattern, which means it picks up primarily from the front and rear of the capsule and rejects sounds coming from the sides. You can use this to your advantage in the studio to help minimize bleed when two or more sources are recording in the same room. The R1 MKII is well-suited for electric guitar, vocals, strings, horns, acoustic instruments, orchestras, choral groups, and many live-sound applications. The R1 MKII comes with a soft transport case and an XLR mic cable. Box Dimensions (LxWxH) 14.5 x 8.0 x 5.7"
R1 MKII Ribbon Microphone is rated 4.2 out of 5 by 6. Rated 5 out of 5 by Steve from Great mic! I was so impressed by the Golden Age pre-73 and the pre-73 mark II that I felt compelled to try one of their microphones. This mic always comes up in forums and I have to say it delivers the goods. It is currently deployed as a center overhead on my drum kit and it is punchy and full sounding with a nice warm vintage flavor. At this price you should be buying two! Make sure you have a good boom stand because this mic is hefty! Rated 5 out of 5 by Sam from Great vocals This guy is my first foray into ribbons, and so far I've used it with a Cloudlifter CL-1 and an old Mbox2. It sounds great, especially for the price. It's smooth and warm on female vocals and much more flattering/forgiving than the CAD 179 I usually use. (FYI, when I recorded my acoustic jumbo guitar, it was pretty boomy on the lows, but I haven't tried it with other body styles. Another reviewer had good results recording acoustic, so my big assed EJ-200 might just be too much for it.) I'd recommend picking up another xlr cord while you're here if you don't have any extras at home. I had trouble fitting the cord that comes already plugged into this mic into my CL-1, but I easily swapped it out (the cord comes secured onto the mic, so it's just a tiny bit more difficult than simply unplugging the cord and plugging in another - you'll need a small screwdriver). Rated 3 out of 5 by Matthew from Unbelievable price, but is there a reason why This mic is awesome, FOR THE PRICE. I went ahead and got 2 to use as drum room mics. I tested them out in Glen Johns configuration, and they were great. Very punchy and big. I also tested it out as a bass drum mic, and it this is where it really stood out. At a 45 degree angle 2ft from the kick, the null of the figure 8 pattern attenuates the rest of the kit nicely but gives you a clear kick with SO MUCH CLEAN USABLE BASS. I also used it on vocals. It did not really shine vocally for the kind of session I was doing until I tracked a blues song, and the vibe was spot on. My gripe with this microphone, the logo on the front is not the logo in the picture. The one pictured above is a nice laser etched deal as you can see. The logo on the mic is a metal version with a crease down the middle (not curved with the body), glued to the body. Are these the same mics? Is it a knock off? Did B&H not label the product correctly, like maybe it was a MkI instead of MkII? Who knows. For this reason and this reason only, I give this a 3 star rating. Rated 5 out of 5 by WHISPERS OF THE SPARROWS from great sounding mic i use this mic on my d16xd sounds full crisp , good for acoustic guitars great on vocals looks big and cool, and i mean really cool looks very vintage you must GET IT for the price. it's a mic you have to have for anything it does not take a lot of money to buy good gear BUY IT!!!!!! would these mics be any good as a choir mic. for eg having 2 placed in front of 15 people? Never tried a choir with these. There is a lot of bottom end. I like this mic a lot but I also have killer mic preamps (Custom shop 1073). Depends on the budget but I'd go for something like AKG 414.